Today, BlaBlaCar has reached a new milestone by closing an important round of investment that will allow us to further extend our impact globally, and pursue our ambition to provide you with the best possible service. As we announce this latest development, we want to take the time to stop and reflect on what we have achieved together. TOGETHER, thanks to your Trust – in our team, our service, but also crucially in your fellow members – BlaBlaCar has become the world’s largest carpooling community, with more than 20 million members across 19 countries. We are making long-distance carpooling reliable and mainstream on a global scale, something that seemed inconceivable a few years back, when Frédéric struggled to find a ride home <his home-town 350km from Paris>, and dared to imagine an online platform connecting co-travellers looking for a ride with car owners going the same way. 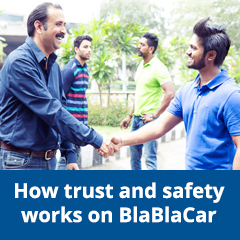 You, the BlaBlaCar community, have made it possible, through sharing trips, leaving reviews that create trust in the community, and recommending the service to those around you. You are the Trust pioneers. TOGETHER, we are creating new human connections as we strive to turn every unfilled car into a BlaBlaCar. Since the beginning of 2014 alone, BlaBlaCar enabled 47 million connections between people whose paths might have never crossed otherwise; members of different ages, cultures, or professional backgrounds, who chose to travel together to make their long-distance trips more enjoyable and affordable. We think this brings us one step closer to a better, more fraternal world. And that’s something worth working hard for! TOGETHER, we’re optimising one of the largest wasted resources worldwide – idle car seats – unlocking new capacity to meet growing aspirations for affordable and friendly mobility, whilst reducing our environmental impact along the way. Did you know that over the past two years alone we have saved approximately 1 million ton of CO2 (which is equivalent to the emissions of 400,000 roundtrips from Paris to New York). That feels great too! The support from our investors will allow us to continue delivering on our initial vision to revolutionize car usage globally, give millions of lonely car owners the opportunity to become ridesharers, and unleash an unprecedented supply of friendly and affordable transport capacity for co-travellers. Share: As we tackle the challenges of significant growth, it remains our absolute priority to stay close to your needs by constantly engaging with you, both online and offline. Innovate: We work relentlessly to continuously improve our mobile apps and website, developing new features that simplify your journeys, and make carpooling a trusted and reliable transport solution. Grow: We develop new partnerships and ensure that a BlaBlaCar is available wherever you need it, that we cover more routes, more frequently, and offer you more freedom and comfort in your shared journeys. Expand globally: We expand to new markets so that you can travel across the map with one same app, share a ride with locals, and feel that you’re part of a global village, whether you’re travelling from Toulouse to Bordeaux, Delhi to Chandigargh, or Istanbul to Ankara. To execute our bold ambition, our team now counts more than 350 passionate people in 12 offices across three continents . Every year we double our headcount, and our recruitment needs are still growing. The new funds raised will allow us to source the passionate talents and technological resources to continue innovating and deploying our service globally, in line with our values which attest to our commitment to you and to our mission. Your trust, high level of engagement and loyalty are the cement of our community. 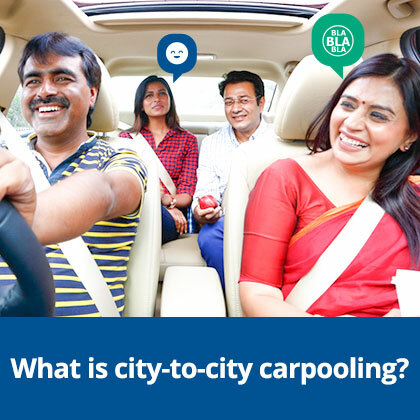 97% of you tell us that carpooling makes for a truly enjoyable ride. That is the indicator that drives us. Nothing could make us happier. On this exciting day, we have really only one thing to say, and that is Thank You. Thank you to twenty million incredible people. Thank you for sharing the ride.